Farming (like any other profession) is a very proficient field that provides so many benefits and can be considered a full-time job, especially if you’re bored and looking to find a hobby, then this is the perfect hobby for you. But like all other professions, you would need to know about the whole gamut and facets to farming. 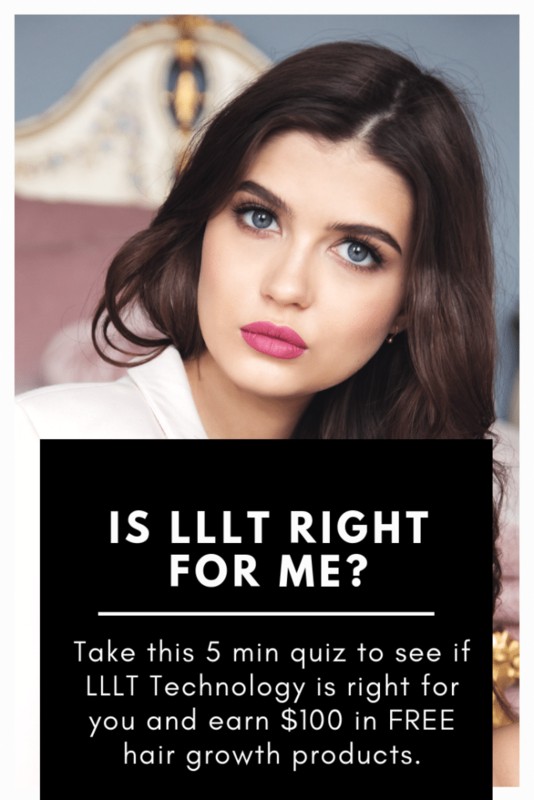 You would need to know the terms, the tools and the cultivation season. Where and when you know all these things, it will be pretty easy for you to master the professions of farming and to make great harvests in your farming business/hobby. The first thing on my list is the wheelbarrow. 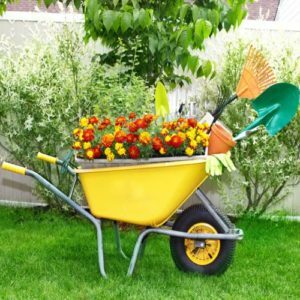 Many people may think, it is just a wheelbarrow; how important could it be. The wheelbarrow is one of those indispensable tools I was talking about. It is a very good tool when you want to lift heavy produces or carry out the weed. In other words, the wheelbarrow, serves as a means of transportation; taking of the weed that is weeded of the beds, and considering that they may be bulk of the farm produce (for larger farms), you may need a wheelbarrow (if you don’t have a truck) to carry the products from the farm to the barn or storehouse. Getting a light but sturdy wheelbarrow matters a lot to make the work easier. It is also the safest way to transport the goods without spilling it. 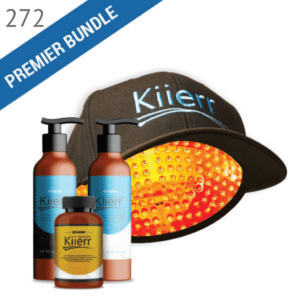 All these tools go hand in hand because they perform similar functions; protect against dirt on the body. The apron should be waterproof. It is the best form of coverage for the farmers, and it is comfortable to use, and perfect for storing tools, when you’re working with small tools. The hand gloves are also an essential tool in this mix; it is what keeps the hands from getting soiled. The gloves should have a good and comfortable material, like a thick rubber, or a very good leather glove will do. The idea is so you have a fun farming experience. Knee pads are good tools for older people that are looking for comfort during their gardening experience. It is not just comfortable to use, but it also keeps dirt off your clothes, especially where you plan on doing only a little farm work and may not need an apron. If you want your crops to grow fast, you’ll need to water your crops, thus you’ll need a watering can. Some people may think that using a watering can is old school, but with the watering can, you don’t have to worry about over watering. The watering cans are inexpensive and easy to make (although not advisable). 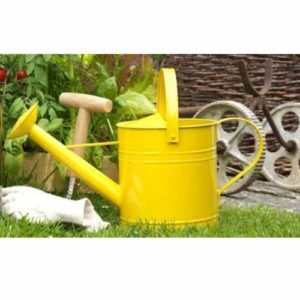 When you’re getting a watering can, it is suggested that you get a galvanized metal or plastic watering can; both of these cans are rust proof, meaning you don’t get unwanted chemicals on your crops while watering. Many of you may be wondering, what is the difference between the hosepipe and the watering can; they perform the same functions, don’t they? Now I understand that many people will rather have the hosepipe than get two tools that do the same thing. 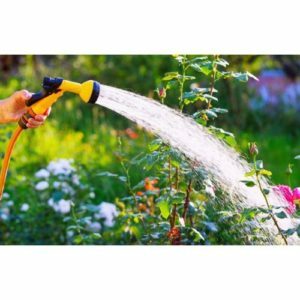 When you begin to think this way, you’ll be doing this at your own peril, while cans are good for small beds and pots, you possibly can’t use the hose pipe on small pots, because the force it produces may kill the crops. Hose pipes are good for water distribution on larger farmland; a form of irrigation system. You should get a rubber hose over the vinyl hose, the latter might cut off the water supply when it begins to kink up, with the former still retains its speed and subtlety. These tools should not be looked over; they are a major determining factor to growing good crops on your farm. Having these tools around cannot be overemphasized. While the mini fork breaks the nursery for planting, the mini trowel helps to transplant the crops with damaging the crops. How you use the trowel is by digging around the crop, gently, then when you’re certain you’ve gotten to the required depth, then you can scoop out the plant from the soil. With the mini fork, you can also weed small pots that your hands may not be able to reach, by loosening the soil so you could have a better grip on the weed. These kinds of tools usually have a comfortable tool grip, with an ergonomic design to help the user to use the tools better. Get tools with an extendable and long handle so you don’t have to be so close to the bed; being too close might damage the crops. Both of these tools are pruners; cutting down all garden shrubs, rose and even fruit trees. Because of the import of the tool, most farmers are reluctant to giving out this tool, which is why it is important that you have your own secateurs and pruners, to avoid embarrassment. 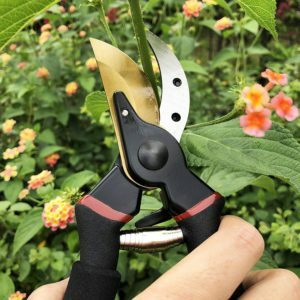 Because of the repetitive nature of the pruning shears, you will need to get the shears and secateurs that have comfortable and firm grips, if not you may have arm and wrist strains. Also ensure that you get a pruner that has sharp blades and will remain sharp for a long time, so you don’t have to spend so much money on sharpening the blades. You could also get shears and secateurs with removable blade, which makes maintenance easier. You do not need to be a farmer or gardener to own a garden rake; if you own a home with a lawn that you mow consistently, you’ll need a rake to clear out the cut off shrubs. The garden rake clears the shrubs and weed that you have cleared of your farmland. As a farmer, you’ll need to be clean and meticulous, so the weed doesn’t grow again. They are two kinds of rakes available for a farmer, which is the landscape rake or garden rake. These kinds of rakes are for bed leveling when you have created a new bed. 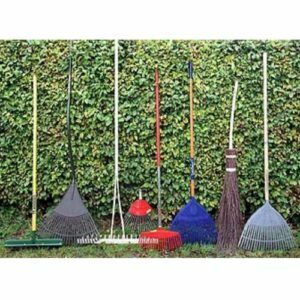 The landscape rake is very wide and can work with any surface material. The other kind of rake is the leaf rake that works well to rake out the leaves and weed of the bed. It is sometimes plastic, which means you can adjust its fingers for a better raking. So we are getting down to the big guns. 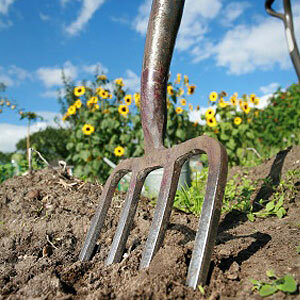 The garden spade is a very reliable tool for bed making, soil breaking and soil turning. There are several kinds of spades available, such as the short handled square-bladed spade and the long handle heart shaped shovels. You can get both of them, but we will be concentrating on the first one, which is the short handled square-bladed spade. 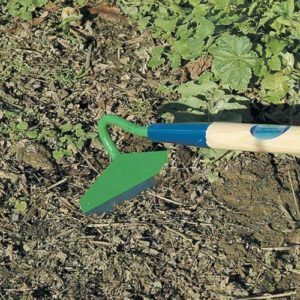 With the spade, you can mix up compost and fertilizers (manure), you can also use its flat edge to cut off the backs of grasses so they can be used as manure in potting soil. 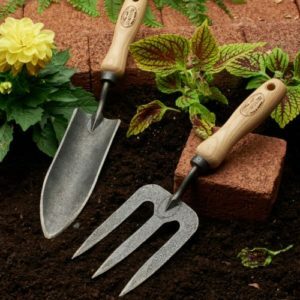 The handles of the spade should be the same as the mini forks and trowels; they have to have an ergonomic and comfortable edge. 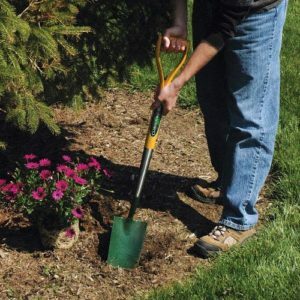 Get a spade or shovel that have a wooden handle with a 1-foot single metal socket that connects to the handle. This design makes the shovel sturdy and durable, as well as light enough for usage. There are two kinds of forks out there and you’ll need both of them. The first is the large digging fork and the other is the cottage fork that is way smaller than the first. Whatever the size of the fork may be, always ensure that the fork itself is at least 10 inches long, so that it can be able to go to the root of the crop. You can also use this tool to turn composts on the soil, and also to harvest potatoes without having to scar them with a blade mark. You can also use the forks to divide large crops (such as the dahlias and the agapanthus) from one another, which is far better than what the spade will give you. Get a fork that is made from the same metal, so that it can maintain its integrity and durability. Also ensure that the tool has 4 square diamond pointed tines, with a V-shaped design, for strength and penetration on any kind of soil. The holy grails of gardening tools; the garden hoe stands out when you want to talk about a garden tool. They are good for digging small holes for seedlings, conducive to breaking soil; you can also use the tool to weed out the beds. The only regret most people have about this tool is that it is made with metal and wooden parts; the head is metal, while the handle is wooden, and since you’re working with gloves or bare hands, there is a possibility the tool may slip out once in a while. Another downside to this design is that it the wooden parts may break easily, leaving you with only a head and no handle. There is, however, a good side to this design; in a situation where you are working under the sun, you would not have to worry about the handle being hot like you would when you use a hoe with a metal handle. 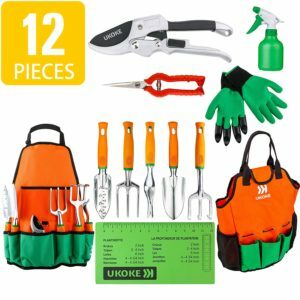 UKOKE garden tool set has twelve sets of tools to start you on your way as you embark on your way to cultivating your own farm produce. The UKOKE toolset is a heavy duty pruner, which can tackle all kinds of farming challenges, be it tough or easy. It comes fully equipped with 5 heavy-duty alloy hand tools, that you can dig, weed transplant crops and loosen the soil with. It also has a packaging system of a high quality, for storing tools after use. The waterproof apron not only helps from keeping dirt off you, but also protects delicate substances from the rain, and it also ensures the tools are close by, for easy access. The set contains 12 sets of farming tools that is not only conducive for beginners but also the ideal toolset for anyone that one wants to go into the business of farming and does not want to get tools individually. One of the many great features of the UKOKE toolset is that it is made with the high-quality material. It has a make that is a high-grade aluminum alloy, that doesn’t just bend or break at constant usage. With the apron, you can work under the rain conveniently. Other than the fact that you can work under the rain, you also get to keep your tools close to you at all times, and since it is a durable material, you can use the material for a long time. 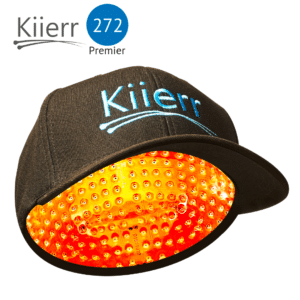 The tools are very easy and comfortable to use. These two features work hand in hand; thus it is easy to use, making it comfortable as well. All the tools have an ergonomic soft grip handle, which makes handling a lot more convenient. With an anti-slip performance, you can rest assured that you will have an excellent outcome. There is a 1-year new replacement for all the tools. There is also the 30-days refund replacement, so you can buy the toolset with confidence and assurance that it works. This toolkit is the perfect toolkit for gardening for your entire gardening venture. Want to work under the sun but you’re tired of standing or bending to work? Why not just kneel. Perhaps kneeling may get some dirt on you. These situations are disturbing. 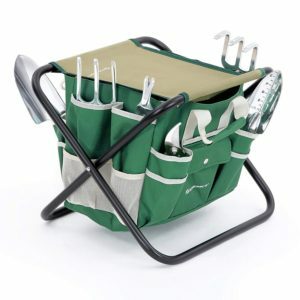 Which is why you have the SONGMICS 8 Garden tools list set with a folding stool. To enjoy your farming work, you’d need the right set of tools, and the SONMGMIC garden tool set is just what you need. 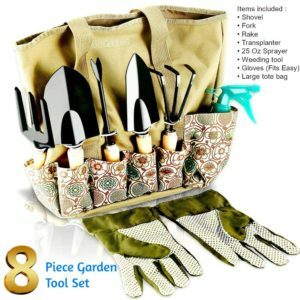 It comes with a durable garden bag that has many pockets for holding your tools. And the foldable stool comes in handy when you’re tired of standing or bending over, or maybe you just feel like sitting down to work, the stool still comes in handy. It comes with so many tools, that are easy to use. These 6 hand tools are also part of the set when you purchase the SONGMICS garden tools. The tote bag comes in handy when during the work, to hold your tools for you. The tote bag is not your everyday bag; it is made from solid Terylene 600D material, and it is so deep that you don’t have to worry about your tools falling out. The tools have a soft grip handle that makes it easy and comfortable to use, preventing the occurrence of any blister. The blades and tines of the tools are made with quality materials, which makes it durable and able to produce the required effects. The stool and the entire toolset carrier are foldable with ensures maximum storage ability. With the scuddle set in your hand, you can provide great meals for your family. The tools in the Scuddle set are essential for every farming work, which is why these particular tools were chosen, for, without them, your gardening experience will be encumbered. The scuddle toolset is a very easy toolset to use, as you’re going to be working with everyday tools. The storage of the tools should not pose any problem, even if you have a small storage. The scuddle tool is also comfortable to use; it is also lightweight but sturdy as well. The tools in the scuddle tools set bag are all new and improved, having an anti-rust stainless steel, and an improved garden tool construction gloves, which are made from the toughest leather, yet still retains its comfortability. The stainless head and wooden handles on the tool is what makes it easy to use and able to last longer. To get the best out of your farm, you’ll need the best garden tools, with that, you are assured that you’ll produce the best yields. The HOTDPR garden toolset can help you achieve that. 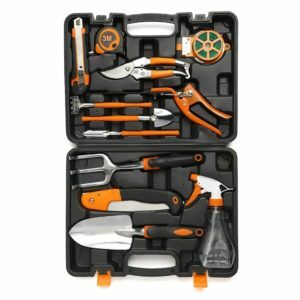 It comes fully packed with 12 different kinds of tools, including; a grass shear, a pruner shear, a folding saw, a spray can twist ties, one sharp knife (to be used with care), measuring tape, and more. It makes garden fun, but also comfortable and easy. When you have all the tools you need around you, then you’ll not have any problem working. That is why the HOTDPR gardening tool should your farming companion. The toolset is portable, molding the toolbox shell together, making it easy for storage. The molding is durable, making it able to withstand the sharp edges of the tools. All the tools and the bag are of high quality. When the material you use for working is good, the product will be good as well. With 12 different tools, you can use the SONGMICS garden tools effectively, without feeling the need to get more tool. It means therefore that the toolset is both multipurpose and economical. 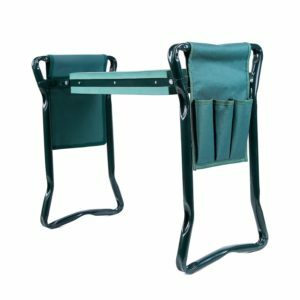 The Ohuhu garden seats and kneeler is a great helper in securing the knee during a farming experience. It makes kneeling down to farm not so bad. You will even get to enjoy the experience. Its seats and knee pad are so thick yet comfortable that you could kneel on a stone surface and not feel a thing while you’re on it. Its cushion is also designed to keep the knee from receiving so much strain while working, thanks to the elevated feature. This feature not only keeps the strain off the knees, it also, helps to protect the trousers or jeans from dirt. It has a padded kneeler that makes farming a blast. The kneeler is contoured in such a thick way that it provides comfort for its users. If you’re feeling tired, you could simply just flip the seat over and rest your back. The seat is also so soft and relaxing that it makes farming work so comfortable. It is not just sturdy, it is lightweight. The combination of this two is usually hard to find, but this kneeler blends them both. 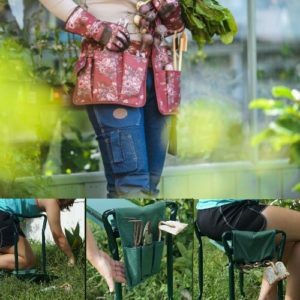 It has a complimentary pouch where you can put all your gardening tools, which makes the kneeler to really be of high quality. 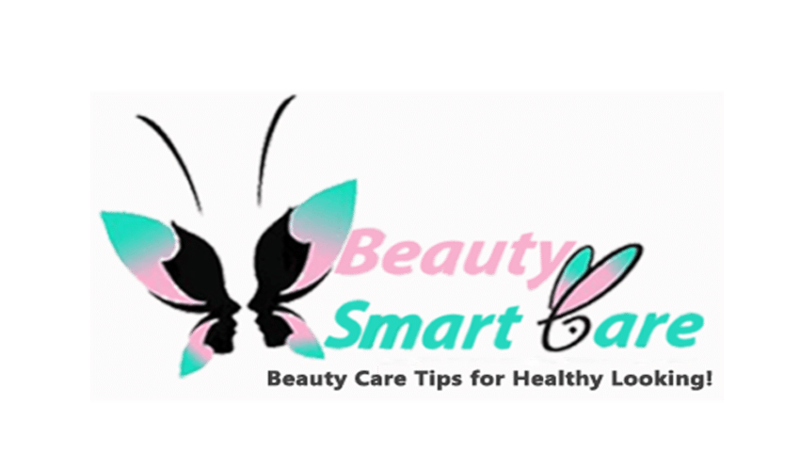 There are no exhaustive lists as to the essential tools, so do not be limited to the list listed above. 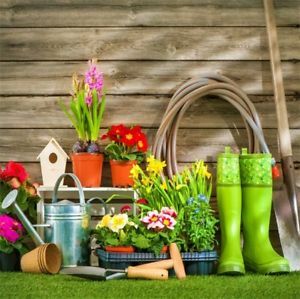 If you have the funds to get more tools, (more than the ones listed above) then you could go ahead and get the extra tools, but where you’re looking to get the necessary tools for your every farm work, then these tools listed above is exactly what you need.